The evidence is building to support the notion that we have seen the low in inflation for the current business cycle. 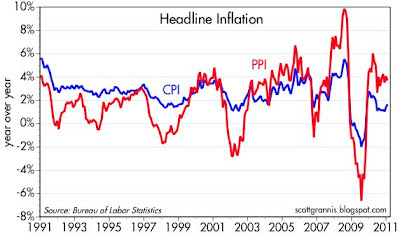 The charts above compare the headline and the core version of both the CPI and the PPI. On a year-over-year basis, all four measures of inflation are rising from their post-recession lows, with the Core CPI bringing up the rear. On a 6-mo. annualized basis, the numbers are more striking. 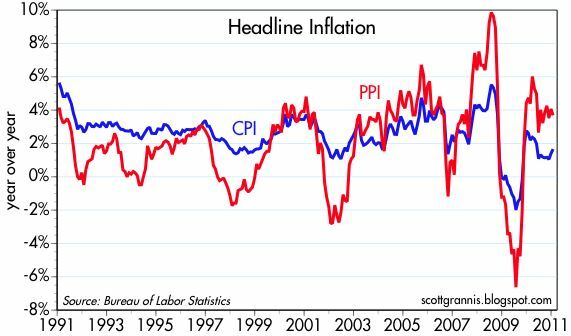 On a headline (total) basis the CPI is up at a 3.2% annualized rate, and the PPI is up at a 7.9% annualized rate. Much of this pickup, of course, is due to rising food and energy prices, since the core versions of both are registering only 1.5% (PPI) and 0.9% (CPI). Unfortunately, it is not possible to ignore food and energy completely or forever, since we can't live without either one. 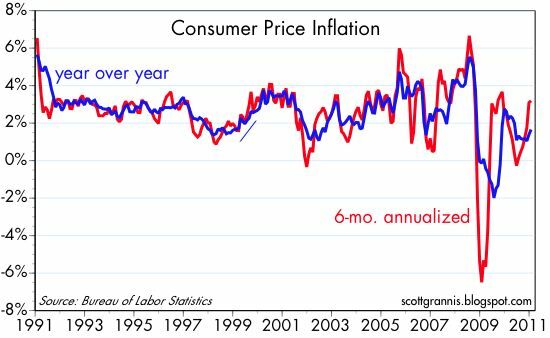 But to insist that inflation is low and not a concern because core measures are still in the range of 1% plus or minus a little is a stretch. On the margin, most measures of inflation are showing a pickup. Plus, sensitive asset prices (gold, commodities, the dollar) continue to reflect a significant deterioration in the dollar's purchasing power, which in turn is the fundamental definition of inflation. All this, at a time when the economy still suffers from a supposedly large degree of "slack," or idle resources. The economy is clearly operating below its potential, but this is not keeping all or even most prices stable, subdued, or quiescent. Conclusion: the traditional (i.e., Phillips Curve) theory of inflation is not doing a good job of explaining events. Inflation is beginning to pick up. It's taken longer than I would have expected, but then the lags between monetary policy and inflation are "long and variable," as Milton Friedman taught us many years ago. 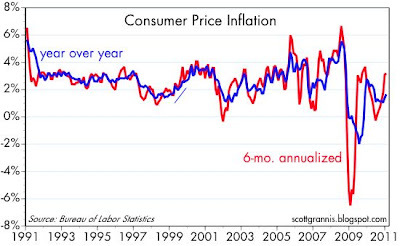 I continue to believe that the last place you will see evidence of rising inflation is in the CPI. 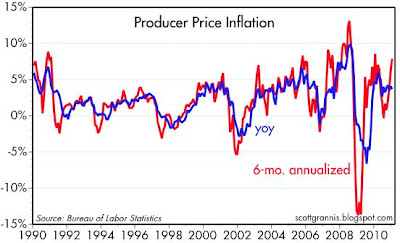 The PPI is arguably a better forward-looking indicator of inflation trends. 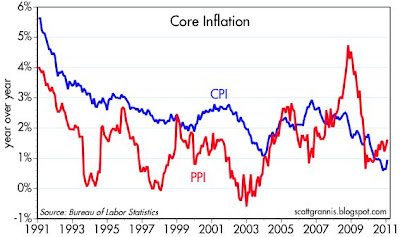 Note that the PPI registered lower inflation than the CPI all throughout the 1990s. We now know that inflation was trending lower during that period, and it reached a low point in 2002-3, and the reason for the lower trend was very tight monetary policy from the Fed. Since then, the Fed has been generally easy, and the PPI has registered significantly more inflation than the CPI; I think that is a good sign that inflation in the current decade is headed higher. The only question is how much and how fast measured inflation will rise. As an investor, I think the reasonable answer is that inflation will rise by more than the market expects. Currently, the market expects inflation to be in the range of 2-3% for the foreseeable future. Investors can seek protection from higher-than-expected inflation by buying assets whose cash flow will rise with rising inflation (e.g., equities), and assets whose cash flows will become more certain with rising inflation (e.g., corporate and emerging market bonds, since paying back debt with cheaper dollars is much easier). I have a tough time rationalizing the purchase of precious metals, since their prices seem to have risen significantly already in anticipation of rising inflation. Meanwhile, although real estate is a classic inflation hedge, real estate prices appear to be at least somewhat depressed relative to other prices, on top of being shunned by all those who are severely underwater, so it might not be a bad addition to one's portfolio. I am very bullish, I agree with Scott Grannis that equities and property are very attractive. We are entering a global bull market that may last a generation. Those parts of the world with free markets will grow almost continuously. Sadly, some parts of the world, such as Islam, North Korea, Burma and other corrupt non-market nations will not participate. But his go-round, we can expect most of the world to participate. R&D is happening globally now. The Internet laces together people and technical knowledge like never before. I agree with Grannis it is hard to get excited about gold---yet demand is driven by emerging middle- and upper-class people in India and China. Who knows how far that will go? I think investing now is like shooting at the broad side of a barn. Equities, properties, blue-chips, tech--everybody is going to do well, and so will property. Inflation? In commodities, higher prices will lead to gluts. Labor still soft. I still say no problem for several years, and I welcome a modicum of inflation anyway. The focus on core inflation assumes that all is well if domestic wages are stagnant. Destructive microeconomic policies that are causing the relative value of domestic labor and domestic assets to collapse plus wildly inflationary macroeconomic policies that create a commodity boom and asset bubbles throughout the world equals 1% core inflation. All is well. We just need to invest in high speed rail from Pensacola, FL to Waco, TX and windmills atop Manhattan skyscrapers to recharge battery powered Cadillacs. When the relative value of domestic labor stabilizes, we are left with massive structural deficits extending for decades. Some combination of inflation and default is inevitable.